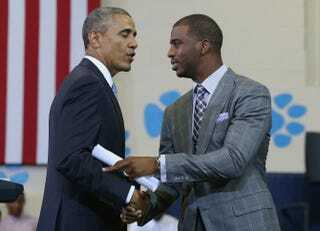 Los Angeles Clippers basketball player Chris Paul (right) introduces President Barack Obama at the Walker-Jones Education Campus in Washington, D.C., July 21, 2014. Some months ago, President Barack Obama announced that his sights were set firmly on helping black and Latino young men with a special initiative called My Brother's Keeper. On Monday the president announced during a town hall at the Walker-Jones Education Campus in Washington, D.C., that new private partnerships have donated some $104 million to help fund the president's mission, the Associated Press reports. "This is a movement that we're trying to build over the next year, five years, 10 years, so we can look back and say we were part of something that reversed some trends that we don't want to see," Obama said. The president touted commitments from the NBA, which hopes to "recruit 25,000 new mentors to work with at-risk students to increase attendance and performance," AP reports. AT&T has also pledged some $18 million to support education programs, which include student mentoring. The Emerson Collective, which works to find innovative talent, has committed $50 million to fund a competition to find the best designs for high schools of the future. The Emerson Collective is the brainchild of Laurene Powell Jobs, wife of late Apple founder Steve Jobs, as well as partners from Silicon Valley, AP reports.